This is a beautiful state park set in an open desert environment. There are no hook-ups, but water is available for filling your fresh water tank and there are flush toilets and showers available as well as a dump station. The view from our campsite out across the fragrant sagebrush and beyond to the mountains in the distance was beautiful. There is very little shade available so this campground would be quite hot in the summer. The bathrooms and showers are clean, but very basic. The water in the shower was not very warm and you have to keep pushing a button to keep the stream of water flowing - an awkward arrangement. It was a very quiet, pretty and peaceful place to camp while we explored the surrounding area. Don't miss Virginia City, an easy day trip from the park. We'd definitely stay here again! We camped at Washoe Lake State Park in a Travel Trailer. Nice state park campground. However, there is no shade so it would be hot in the summer months. I would stay here again in the winter. We camped at Washoe Lake State Park in a Travel Trailer. 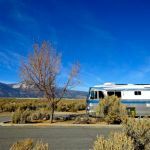 Chose this over all the parking lot type RV parks in Carson City. Very quiet, nice views. Some sites had shade shelters over the picnic table. Many trails for walking, biking or horses. Would stay here again. We camped at Washoe Lake State Park in a Travel Trailer.